A great deal of emphasis, as well as time and money is invested in making UK manufacturing and distribution firms as ‘Lean’ as practically possible. 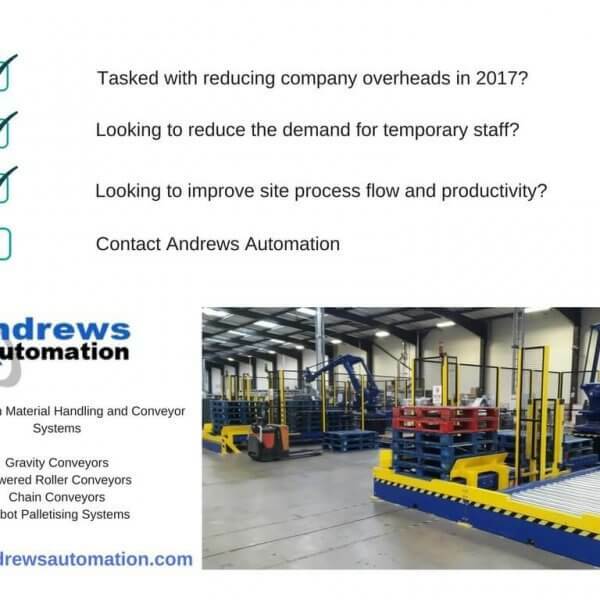 Whether firms are looking to minimise the Six Big Losses, or to create a Continuous Flow and eliminate wasted time and additional handling etc, Andrews Automation Ltd can help with tailored solutions for your business strategy. Many businesses now have Kaizen specialists who constantly look into strategies where employees can work together in order to proactively achieve regular improvements to manufacturing processes in small, incremental stages. Combining the talents and experience of a company and its staff allows ‘many eyes’ to continually look at eliminating waste from site processes. 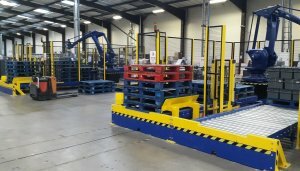 With the additional help of Andrews Automation Ltd, we can look at introducing roller pallet conveyors to reduce the need for Fork Lift Trucks and PPT’s. 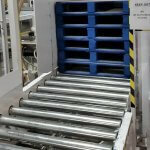 Our portfolio also includes chain conveyors to assist with handling potentially problematic stillages. There is even the option of investing in robot palletising equipment to standardise palletising process times and stacking accuracy. OEE or Overall Equipment Effectiveness is criteria for measuring the amount of lost productivity for any given manufacturing process. The process’ availability, performance and quality are all monitored in order to provide a means of tracking process waste. 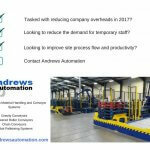 Andrews Automation Ltd can help you reach the goal of 100% OEE by providing reliable End Of Line pallet conveyors and automation solutions operating 24 hours a day, 365 days a year. We are also able to access our more technical systems remotely in order to make system modifications within minutes. Takt Time aligns the pace of production with the demand for product from customers. Solutions from Andrews Automation Ltd can be designed to accommodate a varied range of process speed requirements. These can come in the form of basic Zero Line Pressure roller conveyor adjustments, to controls programs, designed in-house by our controls specialists, which can deal with varying demands on production throughput.